Nigerian versatility in art is so great that it is generally felt that all African nations should view Nigeria as the principal trustee of the most durable fruits of black artistic genius. It is not precisely known when the first works of Nigerian art reached the outside world, but in 1897, following a British punitive expedition to Benin, over 2,000 Benin bronzes and ivories were shipped to England and later dispersed all over Europe and America. At the National Museum in Lagos, works from all over the federation present a vivid picture of the national diversity of arts and crafts. Today, the heritage and tradition of excellence in Nigeria arts continues and typified by the works of world renowned artists. The oldest sculptures found in Nigeria were from the Southern Zaria and Benue areas of central Nigeria. It consists of terracotta figures made by people who achieved a high degree of cultural sophistication. These sculptures, together with other cultural elements, have been named the Nok Culture. The best known Nigerian artworks are the Benin Antiquities. Legend recounts how the Benin people learned the art of bronze casting from Ile-Ife around 1400 A.D. Oba Ogunta, the sixth King of Benin, is credited with having encouraged this art in Benin. Evidence shows the Nok people had knowledge of iron smelting and adorned themselves with tin and stone beads, earrings, nose rings and bracelets. The Nok Culture is dated between 500 B.C. and 200 A.D. The next known phase of Nigerian cultural evolution was Igbo Ukwu bronze casting. Found in the small village of Igbo-Ukwu, near Awka, the casts date from the 9th Century A.D. They first came to light in 1938 and consist of staff heads, crowns, breastplates, pendants, ornaments, anklets, wristlets and chains. About the same time, the Igbo-Ukwu people were casting bronze and the ancient Ife people were also producing works in bronze, copper, and terracotta. In the first quarter of this Century, Ife works caused a great stir among world art critics and historians who were unaccustomed to such naturalism in African art. Nigeria is a vast country with a population of about 140 million people covering about 923,766 square km of landmass, located wholly within the tropics. The country aptly described as the 'Giant of Africa' is richly endowed with ecological and cultural resources, which are of universal recognition. The richness and diversity of the Nigeria culture is a manifestation of the socio-cultural differences of the over 250 ethnic groups that inhabit the land for ages. Casting is still done but there is nothing produced now to compare with the fabulous Ife and Benin Bronzes. These perfect examples of portraiture and the "cire perdue" method of casting, together with the equally perfect terracotta, thought to be of the same period and possibly by the same craftsmen, have no equals anywhere. Apart from the Benin and Ife bronzes, archaeological finds at Igbo-Ukwu, in Enugu State, have revealed advanced ancient works of art. The Igbo-Ukwu bronzes, which have elaborate intricate symmetrical designs, are as remarkable as the better-known Ife works. Bida Brass Works: Bida town is noted for its handicrafts made from recycled beer bottles and coloured glass jars. Brought to Bida from Babah during the reign of the late Etsu Nupe Usman Zaki, popular brass works are found at Gbongbofu, Tswatako and Tswata Mukun area of Bida town in Niger State. The process is almost the same as blacksmithing, except that the raw material is placed in a special basin which is put over fire made by the blowing of bellows. The brass which is the raw material melts after being heated for some minutes. 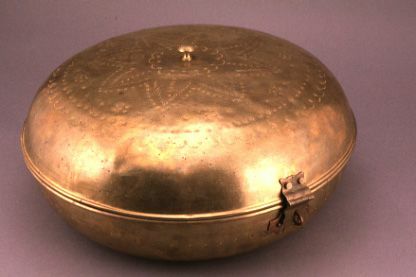 The molten brass is later beaten into required shapes and sizes over an anvil. The products are mainly used for decoration, storage and cooking. For tourist/visitors souvenirs are available in the form of earrings, bangles, rings, trays, plates, walking sticks, brass toys etc. 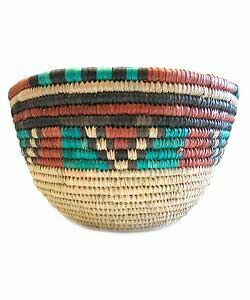 As grass is plentiful in the northern parts of Nigeria, northern craftsmen and women make grass baskets, fans, tables and floor mats. Some of the objects are beautifully coloured and durable. From time immemorial, making figures for shrines, portraiture, masks, and representations of the spirits of the field, forest stream, earth, sea, sky, water, fire and thunder. The works of old carvers remain in many villages where they provide the villages with their shrines, utensils and ornaments to this day. Many of the older examples of these products are preserved in the national and other museums. Ivory carvings have for many years adorned ancestral altars in Benin and the palaces of Nigerian rulers. Ivory carvings are also available in homes and offices as paper knives, inlaid cigar boxes, cigarette holders, ladies earrings, hatpins, necklaces, bangles, and innumerable small pieces of décor. Since the ban on the use of ivory, such objects are made from cow tusks among others. The metal works, glass beads and bangles of Bida are familiar articles to visitors to Nigeria. The bead makers in particular preserve their ancient skills as a family tradition. The metal workers were originally the armoured of the north. Their art is now applied to the production of skilfully fashioned and decorated trays, bowls and pots, rings, bangles and the like. The skin popularly known as Morocco leather comes from goatskin from Sokoto. It was erroneously given the name "Morocco leather" because, until recently, it reached Europe through Moroccan traders who bought them from Nigerian caravan traders across the Sahara Desert. Calabash, a pumpkin-like fruit with various shapes, is widely used as container for food or drinks. Excellent leatherwork and calabash carvings are produced in Kano and Oyo. 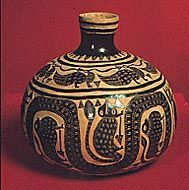 Excavations have shown that pottery attained a high level of development in Nigeria several hundred years ago. The tradition has been maintained and Nigerian pottery today ranks among the most artistic in the world. The best-known pottery centre in the country is Suleja in Niger State. In 1963, a Nigerian pottery worker, the Late Dr. Ladi Kwali, toured Great Britain and Europe to demonstrate the art of pottery making in Nigeria. 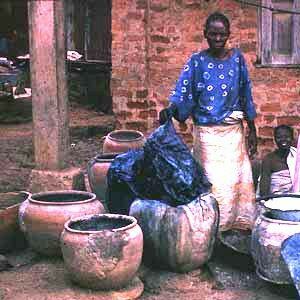 Products of the Pottery centre at Okigwe in Imo State are widely distributed in Nigeria and abroad. 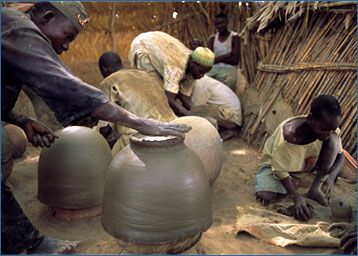 Local pot-makers mould earthen pots in Auakawa village, northern Nigeria. 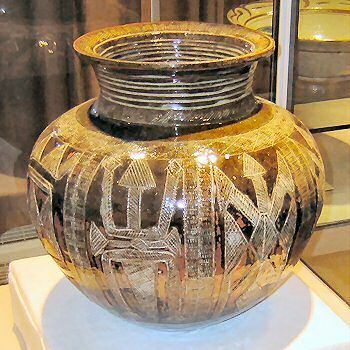 The art of pottery is deeply rooted in Africa, where earthen pots have been used since ancient times as cooking and storage vessels and even as coffins. Another outstanding craft of Nigeria is cloth weaving. The popular Akwete cloth woven in a town of that name in Abia State is fast changing the dress fashion of many women who live in, or come to the country. Produced on a broad loom, Akwete is usually about 1,200 millimetres wide. It is produced in attractive designs and rich colours. There is also the "Aso-Oke" woven on narrow looms notably at Iseyin in Oyo State, the Ebira weaving at Okene, Kogi State. Indigo has been used in the dyeing of fabric in Africa for more than 2000 years. 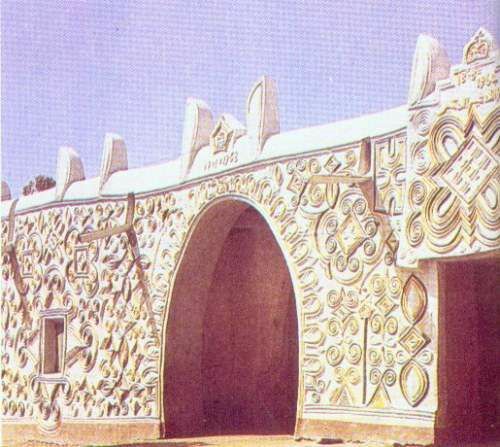 Its presence in Nigeria was recorded in the 16th century. No other people on the continent have developed the art to a higher level than the Yoruba. Among the Yoruba, the art of adire is traditionally reserved to women. The production of adire cloth from the designing through the dyeing to the marketing and wearing is done almost exclusively by women. Apart from such crafts as bronze-casting, wood carving, leather work, pottery and weaving, a form of artistic expression that has quietly gained a stronghold in Nigeria is painting. As a medium of artistic expression, painting is not completely new in the country. The two groups of rock paintings in Kano and Bauchi are the most important yet found in the country. The Birnin Kudu cattle paintings and symbolic drawings show affinity to some Saharan paintings. The colouring of masks monochromatically or polychromatically is also a form of painting that has been in existence in Nigeria for as long as the festivals and ceremonies for which such object s were made. Another form of artistic expression closely akin to painting that has been in practice in the country for a long time is the multicoloured decoration of the inner and outer walls of houses with beautiful and elaborate symbols and designs. Some of such designs have their origin in the Islamic influence on Nigerian culture and are popular in the northern parts of the country. Body paintings and decoration for ceremonial rites and festivals are also a common practice in many parts of the country. The designs and decorations used in body painting possess esoteric connotations and the human body so painted at times in varied contours, visually becomes a really beautiful "living art piece". Traditionally, the women of the Ibo people of Nigeria painted their bodies with patterns. They used a dye made from the seeds of uli plants that temporarily stained the skin black. This type of body decoration is known as uli painting. Uli designs refer to plants and animals; some are also based on objects used in ritual and everyday life. Uli designs emphasize the girl’s best features and highlight her physical strength. The designs are often concentrated around the neck because a long straight neck was considered beautiful and strong. One can recognise uli body painting by its characteristic curvilinear and/or dot patterns and dark blue or black colour when the paint oxidized and stained the skin. Hair braiding represents a traditional art in the Sub-Saharan African community, passed down from generation to generation. The act of braiding also plays a role in female socialisation through the dialogues that occur between grandmothers, mothers and daughters as hairstyles are created. The traditional style of African hair grooming, popularly called “all back”, is made in a way that hair is tightly braided very close to the scalp. The braids can be formed in simple straight lines or in complicated geometric or curvilinear designs. Favoured for its easy maintenance, this hairstyle can be left in for weeks simply by carefully washing the hair using and regularly oiling the scalp and hair. Such hairstyle is often decorated with cowry shell, beads, thread or brass medals, as well as with extensions fixed to the original hair to make it longer. This colorful annual festival takes place in Argungu, a riverside town in Kebbi State, about 64 miles from Sokoto. The leading tourist attraction in the area, the festival originated in August 1934, when the late Sultan Dan Mu'azu made a historic visit. In tribute, a grand fishing festival was organized. Since then, it's become a celebrated yearly event held between February and March. During the festival, hundreds of local men and boys enter the water, armed with large fishnet scoops. They are joined by canoes filled with drummers, plus men rattling huge seed-filled gourds to drive the fish to shallow waters. Vast nets are cast and wealth of fish is harvested, from giant Nile Perch to the peculiar Balloon Fish. Furthermore there is canoe racing, wild duck hunting, bare-handed fishing, diving competitions and naturally, swimming. Afterwards, there is drinking, singing and dancing into the night. Eyo Festival is unique to Lagos area, and it is widely believed that Eyo is the forerunner of the modern day carnival in Brazil. On Eyo Day, the main highway in the heart of the city (from the end of Carter Bridge to Tinubu Square) is closed to traffic, allowing for procession from Idumota to Iga Idunganran. Here, the participants all pay homage to the Oba of Lagos. Eyo festival takes place whenever occasion and tradition demand, but it is usually held as the final burial rites for a highly regarded chief. The Atilogwu dance has been elevated to a dazzling art form, particularly by the Igbo’s in Anambra State. Atilogwu is a vigorous dance which literally means "Is this magic?" and combines elements of gymnastics with foot-stomping rhythms and brilliant colors. It's performed by young men and women who undergo rigorous training before presenting the dance in public. Once approved, the dance is performed during important festivals and great social occasions. In fact, Atilogwu has become a celebrated signature of Nigerian culture, performed around the world. Osun was one of the wives of Sango, the god of Thunder and former king of Oyo. She is widely worshipped in Yoruba land, particularly in the countryside through which the river Osun flows. The water of Osun is said to have the power of making barren women fertile. Her most important sanctuaries are in Oshogbo, which is contracted from 'Oso Igbo', or spirit of the forest, centered on a palace shrine where the chief priest performs rites and rituals.